Creative State is the Victorian Government's strategy to strengthen and grow the state's creative industries and the value they bring to Victorians. Launched in April 2016, following extensive sector and public consultation, the four-year strategy is backed by $115 million in new funding. 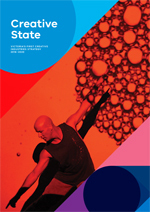 It contains 40 targeted actions that together provide an integrated plan to grow the state's $23 billion creative and cultural economy, provide more opportunities for Victorians to embark on creative careers and enjoy creative experiences, and position Victoria as a globally recognised creative state.